Henry G. Appenzeller, together with his wife, Ella, and in company with Presbyterian Horace G. Underwood, set foot on dry ground at Chemulpo (present day Inchon) on Easter Day, April 5, 1885. From that time until his tragic death in a steamship collision off the coast of Korea in June, 1902, Appenzeller participated in founding Methodist congregations, defended Korean independence from Chinese, French, English, Japanese, and Russian imperialism, promoted democracy, and founded the first western educational institution in Korea, Paichai Hakdang. Appenzeller’s school introduced western education to Korea and graduated many leaders of the Republic of Korea, including Syngman Rhee, the first president of the Republic. Ella Appenzeller assisted Mary F. Scranton in the founding of Ewha Women’s University, an excellent woman’s university in Seoul which conducted its centennial celebration in June, 1986. Appenzeller was born in 1858 to fourth generation Pennsylvania Dutch parents. At eighteen, while preparing for college at West Chester Normal School in West Chester, Pennsylvania (1876-1877), Appenzeller experienced a spiritual conversion during a revival meeting. He met Methodists shortly thereafter. In 1878 Appenzeller enrolled in Franklin & Marshall College in Lancaster, sent there and financially supported by his father to prepare for the German Reformed ministry. While a sophomore, prompted by a deepening sense of evangelical piety and attracted by the Methodists in Lancaster, Appenzeller decided to switch his membership from the German Reformed Church to the Methodist Episcopal Church. He became an assistant pastor in the Methodist Episcopal Church in 1880, pastoring, appropriately, the East Mission of the First Methodist Episcopal Church of Lancaster. Upon graduation from Franklin & Marshall in 1882, Appenzeller enrolled in Drew Theological Seminary, Madison, New Jersey. Appenzeller demonstrated his first serious interest in foreign missions at Drew. He submitted a request to the Board of Foreign Missions of the Methodist Episcopal Church for an appointment to Japan, but no openings existed. Instead, Korea opened as a mission field in late 1884 and the Board considered Appenzeller for the assignment. A key member of the Methodist Mission Board selecting the missionaries for Korea, the Rev. 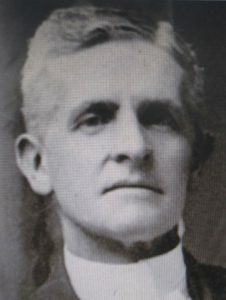 John F. Goucher, feared Appenzeller possessed neither the diplomatic skills nor the maturity necessary to build Methodist congregations in Korea. But the Board, noting both Appenzeller’s experience as an educator (he taught in the Pennsylvania public school system from 1878-1880 while attending Franklin & Marshall College) and his training for the Methodist ministry at Drew Theological Seminary, on December 20, 1884 finally decided to send him and his bride, Ella, to Korea. They would join previously selected missionary doctor, William B. Scranton. After his arrival in 1885, Appenzeller’s view of Korea changed from bitter to sweet in just two short years. His school, Paichai Hakdang, received official recognition from the king and Bishop H. M. Warren formally opened his new school building in September, 1887. The Protestant missionaries baptized Koreans. Hospital work flourished. Appenzeller concluded a safe and encouraging survey trip to Pyongyang during April and May, 1887, and Bishop Warren, during the first episcopal visit to Korea by a Protestant bishop in September, 1887, invigorated Appenzeller and the entire Methodist Episcopal Mission by stoutly supporting their educational, medical, and evangelical work. Adapted with permission from Daniel M. Davies, “Henry G. Appenzeller: Pioneer Missionary and Reformer in Korea,” Methodist History 30 no. 4 (July 1992): 195-205.